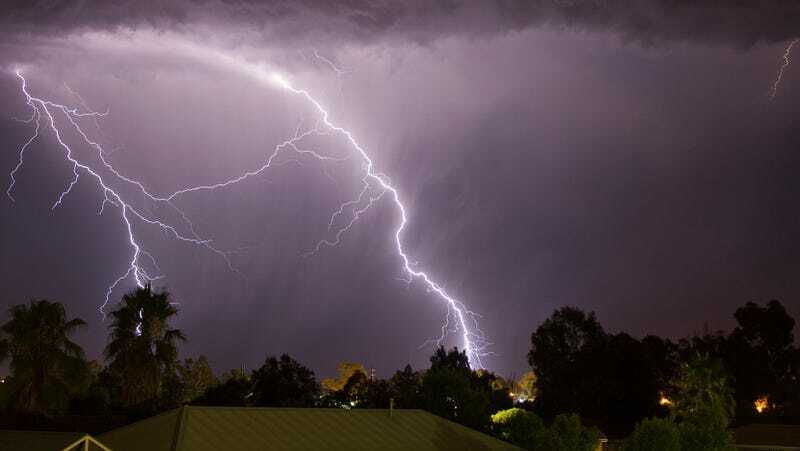 Four people are dead and another 1,870 people had to be treated for shortness of breath when a rare condition known as “thunderstorm asthma” struck the Australian city of Melbourne earlier this week. It sounds weird, but thunderstorm-induced asthma is actually a thing. As the Associated Press is reporting, a storm rolled through Melbourne this past Monday, causing rain-soaked ryegrass pollen to explode and disperse over the city. The sudden influx of pollen triggered asthma attacks among many of the city’s residents, including people who had never suffered from asthma before. Four people died as a result, while first responders had to attend to more than 1,870 cases. That’s about six-times the usual workload for a Monday evening. Seven patients had to be admitted to the Royal Melbourne Hospital’s intensive care unit. Some grass allergen (like ryegrass allergen Lol pIX) is located on the surface of starch granules within pollen grains. A single pollen grain contains up to 700 starch granules of 0.6 to 2.5 um (small enough to reach the lower airways in the lung). When it rains or is humid, pollen grains can absorb moisture and burst, releasing hundreds of small allergenic particles that can penetrate deep into the small airways of the lung. In Melbourne’s case, the level of rye-pollen particles was more than double the level that’s considered high. Other documented cases of thunderstorm asthma have been reported in Canada, Italy, and the United States. In 1994, a storm blew through London, sending 640 residents to the emergency room.